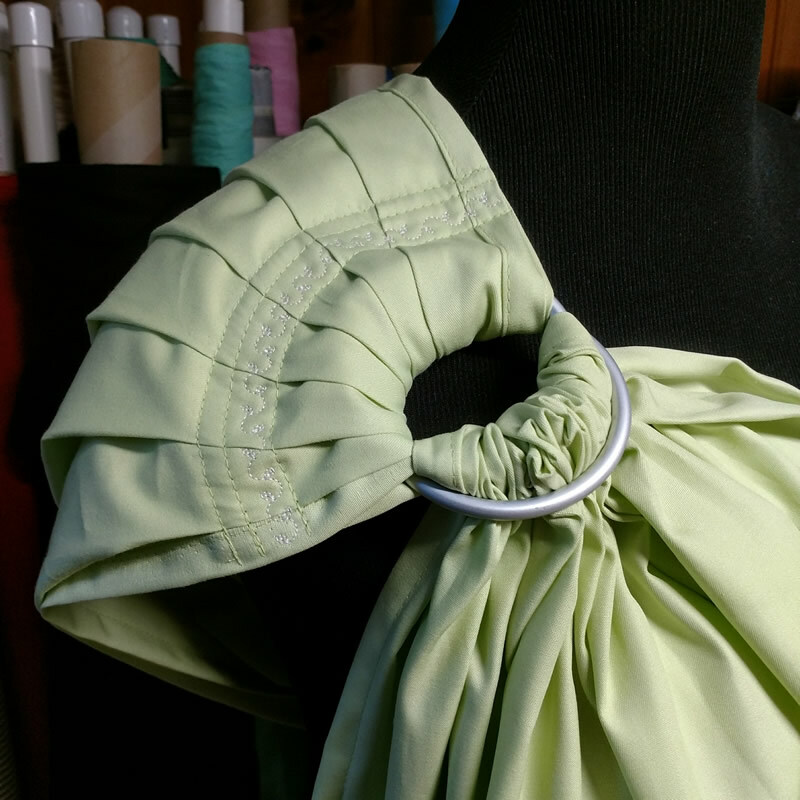 While all ring slings are made with the same basic design -- a length of fabric with two rings on one end -- the design of the shoulder can make a big difference for the individual wearer. 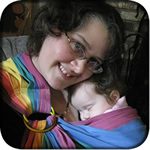 There are many ways to fold fabric in a ring sling -- for more, check these out -- and each one has its pros and cons for different-sized wearers, although there is no hard-and-fast rule about what fits who better. Two people with nearly identical builds often prefer completely different shoulder styles, so if there's a babywearing group near you, I'd recommend a visit to try a few slings out and see what you like. All ring slings are made to go over one shoulder, not both. If you are looking for a two-shoulder carrier, which will distribute your child's weight over both shoulders, please see my links page for some suggested types. Very bottom is gathered (stone), shown for contrast; I haven't tested my slings for gathered shoulders and therefore can't do them anymore. Overlapped pleats give even support across the whole shoulder and back, allowing the fabric to spread naturally along carefully stitched lines. Also works for petite wearers who like to wear their rings high, as the faster spread allows a high ring while still providing generous support over the back. 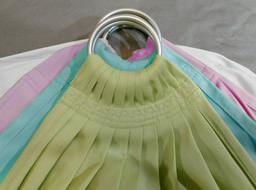 As with signature pleats, can't be scrunched smaller. Once you find your "sweet spot", comfortable on most body types. 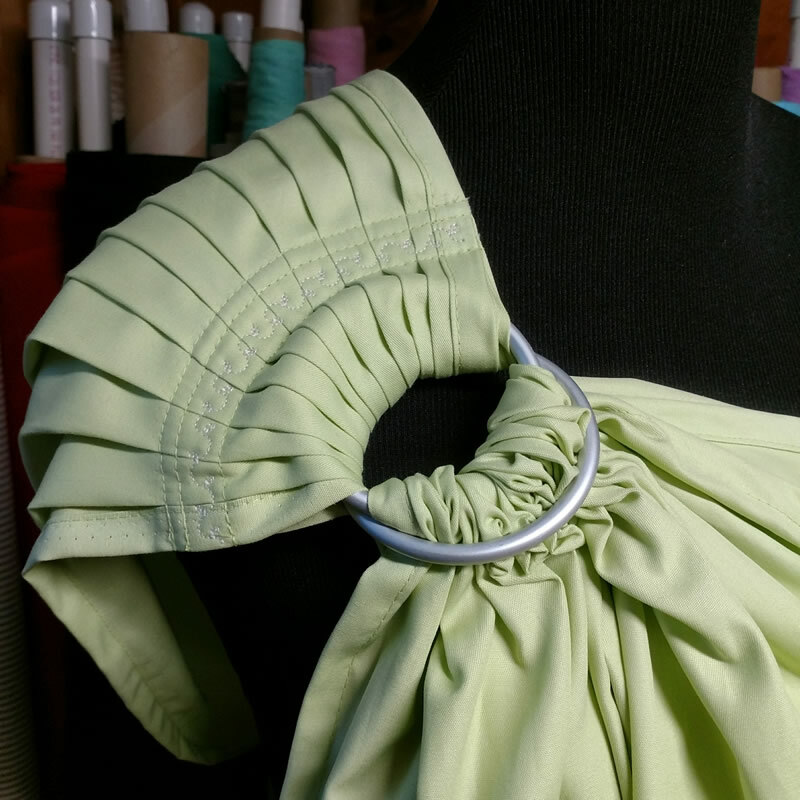 Can take a little longer to put on than pleats -- without arranging it when putting it on, the gathered section allows the fabric to spread far down the upper arm, limiting range of motion and potentially causing discomfort. Seam may fall on the top of the wearer's shoulder, which can be uncomfortable with a thicker fabric. * Karen Hoppis invented this design in 2005, and when she stopped sewing professionally in 2011, allowed me to license the design in the US. Please be advised that other vendors are selling this shoulder style (usually calling it simply "hybrid") without credit to Karen and without paying her for her design. This is not done with her permission. I am often asked to do other shoulder styles on slings, but it's not something I can do. 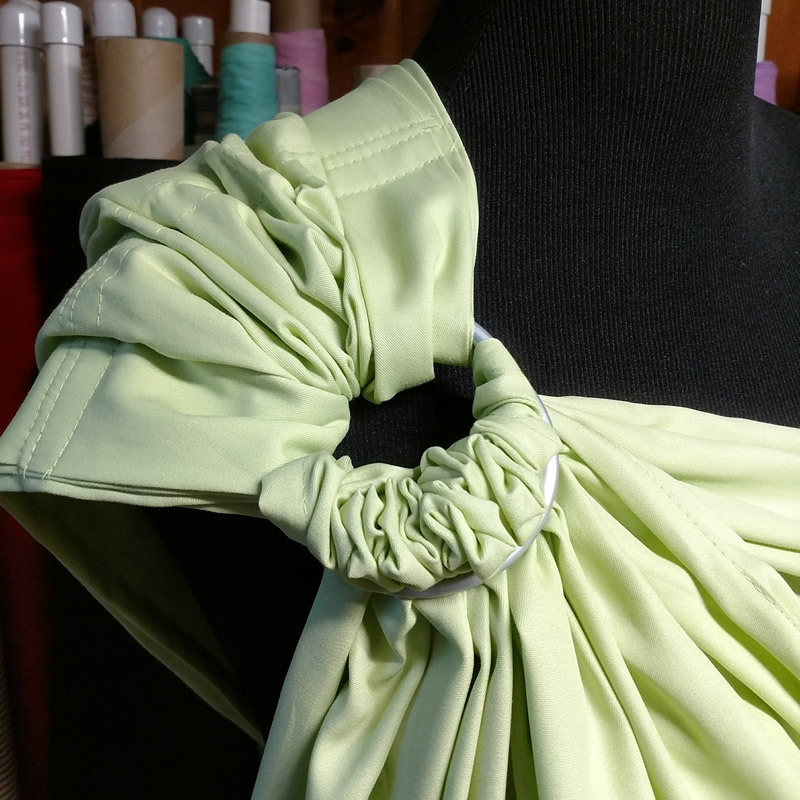 With the new testing regulations, everything I sew must be tested with every shoulder design, and I have tested only pleats and Eesti. Wondering how a sleeping baby sling compares to more expensive brands? Here are a few photographs of basic construction details -- how the rings are sewn in, and the hemmed edges -- so you can see how they differ.